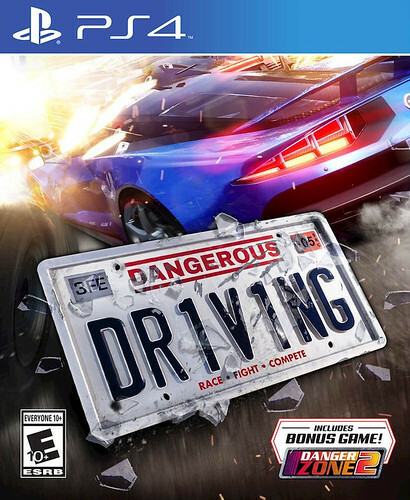 I've been playing Dangerous Driving all weekend...and it's a legit sequel to the Burnout series. Looks, feels and plays like classic Burnout..but with enough new tweaks to keep it fresh and interesting. Bendy and the Ink Machine was released months ago, at least in Canada it was. I will need to watch some more gameplay footage, because the trailer they released just did nothing for me. The cars just seemed to float around the track and the sense of speed just seemed to be a visual artifact of blurring and smearing on the sides of the screen rather than the car feeling like it is going fast. That, and the super low first person view just did nothing for me. "Actually, I go by Susan." "That is a girls name." I can't think that is just a name joke due to the progressive backlash the producers will get. It can only mean one thing. Umm.... it's almost EXACTLY like Burnout 3 Takedown in all respects except the licensed soundtrack. Which means it's almost completely freaking AWESOME. I'm definitely with MJ on this one. :) *sings* "WE ARE THE LAZY GENERATION!" The crashes seemed less flashy, the environments duller, and the reliance on using Spotify (if your own soundtrack) while playing the game definitely has me doing a "wait for sale" holding pattern on this game. You mean, a "Discworld" reference? Cool!